• How good is the reproducibility of the ETSI ES 202 396-1 and ETSI TS 103 224 background noise (BGN) simulation methods? • Do the different BGN simulation technologies lead to different 3QUEST results when measuring the same device under test? Four labs, seven devices, two bandwidth-modes, six background noise scenarios, two setups - every combination measured with HAE-BGN and with 3PASS: from April to August 2015, the round robin test was conducted by four labs all around the world. Each lab was testing seven different devices in narrowband and wideband mode with six background noise scenarios (e.g. cafeteria, train station) with the above mentioned background noise simulation techniques in handheld hands-free and desktop hands-free setups. All labs used HEAD acoustics´ communication quality analysis system ACQUA with the background noise simulation systems HAE-BGN and 3PASS. The database used for the measurements was provided by HEAD acoustics to every participant. 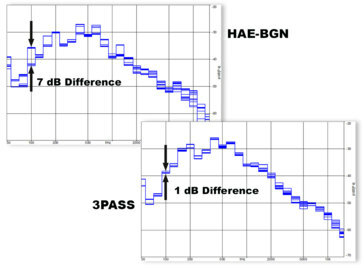 HAE-BGN requires a manual equalization based on tolerance guidelines. As a consequence, larger variations between labs may occur. However, for 3PASS equalization is conducted fully automated and always by impulse responses. This leads to a highly accurate reproducibility of background noise scenarios across different labs - an essential advantage of 3PASS. HAE-BGN (ES 202 396-1) and 3PASS (TS 103 224). • Accuracy and consistency: When using TS 103 224 the reproduction of the background noises at the terminal are much more accurate and consistent - especially in the low frequency domain below 2 kHz. 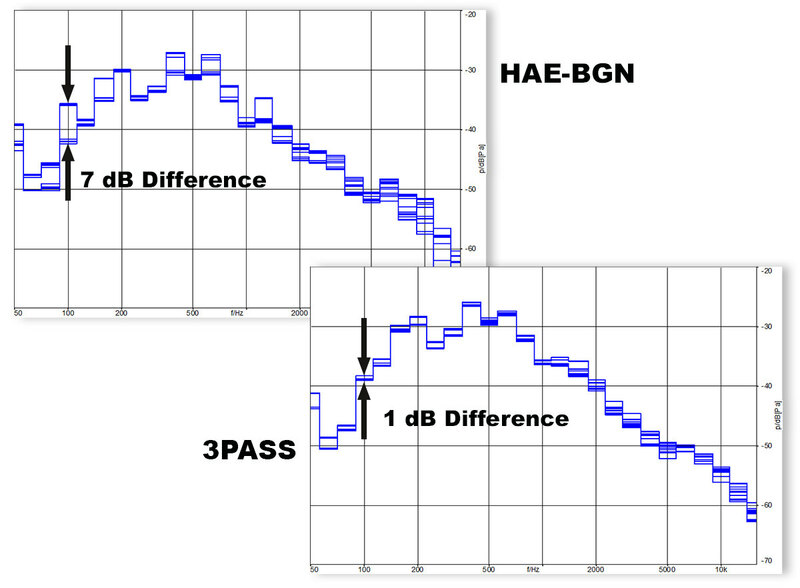 With the 3PASS simulation method the spectral differences measured at the reference microphone drop to 1-5 dB when measuring in 1/3 octaves (5-15 dB for HAE-BGN simulation method). • MOS-values: When comparing the two BGN simulation methods regarding the MOS-values the differences are small (about 0.1 to 0.2 MOS). For the tests binaurally recorded background noises from TS 103 224 were used. The tests have shown that the offset is not constant but depending on the type of terminal. 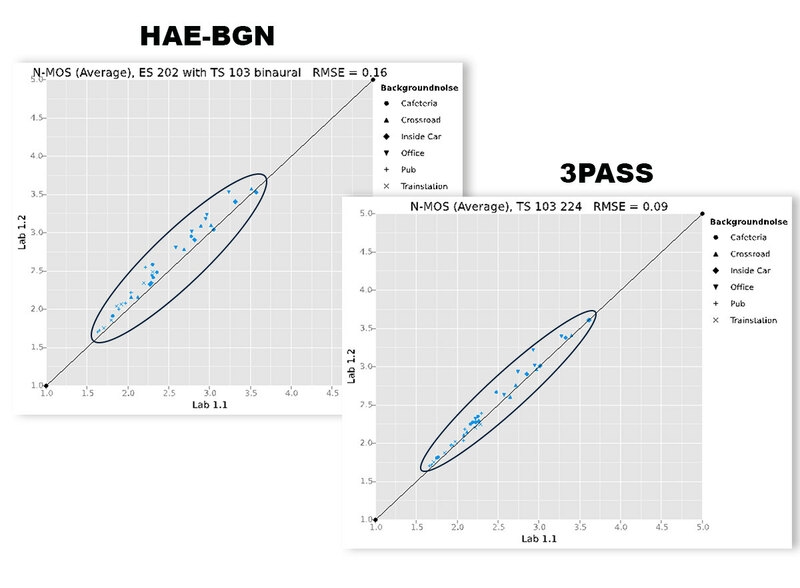 Another important finding is that the inter-lab correlation when using 3PASS simulation method is higher than with HAE-BGN (cf. diagrams below). • Handheld hands-free and desktop: Comparison of the two simulation methods regarding the analysis in handheld hands-free mode according to the current version of TS 26.131 and TS 26.132 and averaging S-, N- and G-MOS over all background noises are small with background noises from TS 103 224 (in the range of 0.1-0.2 MOS; terminal dependent). When testing in desktop position the differences are slightly bigger (about 0.2 MOS) compared to HHHF mode. As a consequence of the 3GPP round robin test, the standardization institute is discussing to adopt 3PASS technology (TS 103 224) as the recommended method for background noise reproduction. For 3GPP members the results of the round robin test can be downloaded from the 3GPP website. HEAD acoustics was founded in 1986 and has been involved in noise and vibration, electroacoustic and voice quality testing since its inception. HEAD acoustics is based in Herzogenrath, Germany, with affiliates in USA, Japan, France and Great Britain as well as a world-wide network of representatives. The Telecom Division of HEAD acoustics manufactures telecom test equipment and provides consulting services in the field of speech and audio quality. Moreover, HEAD acoustics closely co-operates with DECT Forum, ETSI, ITU-T, 3GPPP, TIA CTIA, GSMA and other standardization bodies with regard to the development of quality standards for voice transmission and speech communication. In many partnership projects, HEAD acoustics has proven its competence and capabilities in conducting tests and optimizing communication products with respect to speech and audio quality under end-to-end as well as mouth-to-ear scenarios.